The murder and trial was such popular fodder for the local newspapers that even when there was nothing new to report, because court had been adjourned on Sunday, the Monday paper had a “human interest” story about the trial, and the Tuesday paper, because Monday was the 4th of July and court was adjourned that day, too, had a brief story speculating about what was to come next. So, here’s the week’s action in court, exactly 59 years ago this week. As door bailiff during the Casper Oveross first degree murder trial, Bill Barlow, Willamette University law student, has something many courtroom spectators must have envied since the trial began June 21–he has a good seat for every day of what promises to be Marion County’s lengthiest trial in recent history. It’s Barlow’s job to handle the standing-room only crowds which have been packing Circuit Judge George R. Duncan’s courtroom daily since opening day. The crowds have been so large, in fact, that Judge Duncan has set an age limit for admittance. Only those over 15 years old can attend. “Twice,” Barlow said, “I’ve had to turn away the nine-year-old son of one of the attorneys on the case.” The first few days, he said, weren’t too bad as far as the crowd was concerned. But the day they started calling witnesses, spectators were packed in the hallway. During the first few days of the trial one of the door bailiff’s biggest headaches was separating the spectators from the witnesses, who are not allowed inside the courtroom except while testifying. One witness, however, got by him and Barlow had to take him out of the courtroom, much to the witness’ annoyance. Another witness got bored just waiting in the hallway to be called. When his turn finally came to testify, Barlow found him riding up and down in the elevator. Most of the spectators, Barlow said, appear to be retired elderly people with nothing else to do but listen to the testimony. Many, of course, come from Silverton where both Oveross and Ervin Kaser, the man Oveross is accused of murdering last February, are well-known. Details of long weeks of detective work by sheriff’s deputies and state policemen are expected to be unfolded today as the first degree murder trial of Casper A. Oveross opens its third week in Marion County Circuit Court here. The prosecution will probably put Deputy Amos Shaw on the stand first today as it begins it attempt to link the rifle which it claims killed Ervin Kaser last Feb. 17. Much of today’s testimony is expected to be built around the investigation of Shaw and State Policeman Lloyd Riegel, concerning ownership of the 30-30 Winchester carbine which has been admitted as evidence in the trial. Among those witnesses who may also testify in the half-day of court are Marion Zahler and Omer Bailey, both employes of a Silverton hardware store which had reportedly sold Oveross such a gun in 1949. The trial resumes at 1 p.m. after a Fourth of July holiday recess. Just how detailed the chain of evidence is concerning the ownership of the murder gun has been a closely guarded prosecution secret. The gun ownership, the motive for murder and the expected testimony of persons who saw Oveross the night of the slaying have been labeled the key points in the state’s case against the 43-year-old carpenter. Oveross, who witnesses have testified blamed Kaser for break-up of his marriage and threatened to kill him for it, is accused of firing four shots into Kaser’s automobile at the victim’s home south of Silverton. One of the bullets struck Kaser and killed him instantly. Ownership of a rifle of the same type as the weapon which killed Ervin Kaser was linked Tuesday to Casper Oveross, now on trial here for Kaser’s murder. Mrs. Marion Zahler, now of Eugene but formerly of Silverton, testified in Marion County Circuit Court that she sold a 30-30 Winchester carbine to Oveross on March 5, 1949, when she was an employe of the Ames Hardware store at Silverton. Linking Oveross to a gun of the type which state’s testimony indicates was the murder weapon was the major evidence presented Tuesday, the 11th day of the first degree murder tiral before Circuit Judge George R. Duncan. Police officers who interrogated Oveross after the Feb. 17 slaying at Kaser’s home south of Silverton testified earlier that the defendant had denied ever owning a 30-30 rifle. Defense Attorney Bruce Williams states Oveross has never made such a denial. Testifying also in connection with the reported sale of the gun to Oveross were Deputy Amos Shaw, State Policeman Lloyd T. Riegel, Norris Ames, Omer Bailey and Carl Handy. Shaw and Riegel told of finding the sales slips, invoice, letter and account sheets in the records of the Carl Handy Hardware store, owned in 1949 by Ames. Bailey was also an employe of the store at the time Oveross is reported to have made the purchase. All of the records except the invoice were admitted as evidence Tuesday. The prosecution is expected to call Steve Zolotoff and Casper Towe, both of Silverton, to the witness stand today in an attempt to shorten the link of ownership and establish the invoice, which contains serial numbers of two rifles, as evidence. The trial will resume at 9:15 a.m. today. A second set of murder scene photographs, aimed at countering defense counsel hints that the death car may have been moved prior to complete investigation, was admitted as evidence Tuesday in the murder trial of Casper Oveross here. Deputy John Zabinski of the Marion County sheriff’s office testified he took the several pictures of the scene of the slaying of Ervin Kaser about an hour and half after the crime. He testified that the car was not moved or touched to his knowledge before Ralph Prouty of the state crime laboratory took other pictures several hours later. The pictures taken by Prouty were the first seven exhibits submitted in the prosecution’s case over a week ago. Zabinski was the last of seven state’s witnesses called during Tuesday’s session and he was still on the stand when court recessed for the night. At the time of the recess defense attorneys Bruce Williams and Otto R. Skopil Jr. had opened a battle against further testimony by Zabinski relating to some measurements made by him at the crime scene last week. Bulk of Tuesday’s testimony centered around the sale of a 30-30 Winchester rifle by the Ames Hardware store of Silverton in 1949. Mrs. Marion Zahler, then a bookkeeper and clerk at the store, said she sold such a gun to Oveross at that time. Mrs. Zahler identified sales slips and invoices involving receipt and sale of the rifle and testified she had actually concluded the sale to Oveross. Records of the store show Oveross bought a rifle on March 5, 1949 for $62.45, charging it to an open account. Testimony of Mrs. Zahler, Omer Bailey, another employe at the same time, and Norris mes, then owner of the store, indicated that guns were then in short supply and that rifles were bought almost as soon as they arrived. Ames said the invoice, offered for evidence Tuesday, indicated that two .30 caliber Winchester were received at the same time. Testimony indicated one of the two, listed on the invoice by serial numbers, was sold to Oveross by Mrs. Zahler, and the second was sold to Steve Zolotoff by Casper Towe, also a store employe at that time. Special Prosecutor Charles Raymond and District Attorney Kenneth O. Brown said Zolotoff and Towe would be called to testify today to show that the second gun is still in Zolotoff’s possession. They say this will prove that the gun sold to Oveross is the same gun which was found May 8 in the Pudding River and which ballistics tests prove was the murder weapon. First on the stand for the state Tuesday was Deputy Amos Shaw who testified he was called to the Pratum home of John Roth the afternoon Larry Wacker and two companions discovered the rifle in the river. He said he took possession of the gun, taking it the next day to the state crime laboratory in Portland for examination by Prouty. Shaw said he did not attempt to look through the barrel of the gun when it was turned over to him. He described the gun as being muddy with some rust on it at that time. He would make no estimate under cross-examination as to how long the gun had been in the water. Shaw also testified to a search of records of the Ames Hardware store back in March when documents showing the sale of a rifle to Oveross were located. He said he, Officer Lloyd Riegel of the state police and Carl Handy, present owner of the store, made the original search March 10, about two weeks after the slaying. A letter found in the letter file of the Ames’ records only Tuesday morning, was among the records offered in evidence during the day by the prosecution. Mrs. Ethel Oveross testified in circuit court Wendesday that she was with Ervin Kaser a short time before he was slain near Silverton. Her former husband, Casper Oveross (back to camera at right) is on trial for first degree murder in the Feb. 17 slaying. The curtain of rumor covering the activities of Ethel Oveross and Ervin Kaser on the night Kaser was slain was pulled back Wednesday when Mrs. Oveross took the stand as state’s witness in the murder tiral of her former husband Casper Oveross. Mrs. Oveross, poised but soft-spoken during her testimony, was one of 18 witnesses called by the prosecution Wednesday as the tempo of the trial picked up in Marion County Circuit Court here. Appearance of Mrs. Oveross on the stand opened a running battle between defense attorneys Bruce Williams and Otto Skopil Jr., and prosecution counsel Charles Raymond and Kenneth O. Brown, Marion County district attorney over admissibility of evidence. Mrs. Oveross told of meeting Kaser north of Silverton about 7:45 p.m. Feb. 17, the night of the slaying. She said they drove onto Monitor highway in Kaser’s car and around toward Mt. Angel before parking on a side road for about an hour and a half. No other details of the evening were given except the return home, which she said was made in their separate cars about 10:40 p.m. She said she never saw Ervin Kaser again after they drove away from their rendezvous place on the north side of Abiqua Creek. Attempts by the defense to ask several questions about the family relationship of the Oveross couple in the past three years were beaten down for the most part in objections by the prosecution. Twice, however, Mrs. Oveross answered defense questions during cross-examination before the objections could be heard. Activities of Oveross during much of the night of the murder were traced by nine of the witnesses appearing Wednesday. They were called after defense counsel blocked attempts by the prosecution to enter testimony about a second 30-30 Winchester rifle reportedly on the same shipment as the one which witnesses said Tuesday Oveross bought back in 1949. A new effort to have the testimony entered will probably be made today when Steven Zolotoff, reportedly the owner of the gun, is called back to the witness stand. The trial, starting its 13th day today, resumes at 9:15 a.m.
Casper Oveross and his former wife Ethel faced each other Wednesday for the first time since Oveross was charged with slaying Ervin Kaser, the man he blamed for breaking up his marriage of nearly 20 years. They faced each other across a scant 10 feet of courtroom, Oveross at the counsel table as defendant in a first degree murder trial, and Mrs. Oveross on the witness stand as a witness in the state’s case against him. No sign of recognition crossed Mrs. Oveross’ features and Oveross retained the same expressionless composure he has held through the twelve days of the trial. Only once did Mrs. Oveross appear to take a fleeting look at her former husband. Mrs. Oveross, who divorced her husband last Oct. 7, was on the stand for 21 minutes, relating mostly the events of the night of the slaying last Feb. 17. In a voice so barely audible that Circuit Judge George R. Duncan requested her to speak louder and address her answers to the jurors, Mrs. Oveross told of her activities during the evening in answer to District Attorney Kenneth Brown’s questions. Question: Did you see Ervin Kaser on the night of Feb. 17, 1955? A: At a place about 2 miles north of Silverton on the north side of Abiqua Creek. Q: What time did you arrive at that place? A: About a quarter of eight in the evening. A: I drove in my car. Q: And how did he arrive? A: I left my car there. We drove onto the Monitor highway, around toward Mt. Angel and back toward Silverton. We drove up a side road and stopped for awhile. Q: About how long were you there? A: I couldn’t say how long we were there, probably about an hour and a half. Then we drove back to my car. Q: And then what did you do? A: I drove home in my car by the way of the lower bridge (James Street bridge). Q: What time did you arrive at your home? A: I got home about 10:40 p.m. Preceding Mrs. Oveross to the stand was an Evergreen Community couple who testified they had seen Casper Oveross at his former home the night of the slaying. Robert Barnes and his wife Sibyl, who reside about a mile and half south of the Ervin Kaser home, told of seeing Oveross’ car back out of the driveway as they headed for Silverton enroute to a Woodburn Grange meeting shortly after 8 p.m. that night. They told of following behind Oveross car until in front of the Kaser home where they said Oveross slowed down to 10 to 15 miles an hour and appeared to be leaning over in the driver’s seat to observe the house. [EK_NOTE: this would have been when Oveross was, as Collen Oveross and Danny Gilham told police, visiting her at her home, and both cars were now traveling north toward Silverton, so Ervin Kaser’s house would have been on their right-hand side.] They returned after 11 p.m. they testified, relating that several cars were at the murder scene at that time. Barnes estimated the time at about 11 p.m. and Mrs. Barnes 11:30 p.m.
A visit to the Barnes home by Oveross on the day his divorce settlement was made was also recounted by the couple who testified Oveross had made the statement then, “One thing, if I catch Ervin Kaser under any roof I’m working on, I’ll kill him.” Barnes told also of a visit paid by Oveross on the day of the slaying, but didn’t recall that Kaser was mentioned on that day. Mrs. Barnes said the first they knew that a shooting had occurred was when they dropped her mother-in-law off at her home between Kaser’s and their home. She said Mr. Barnes remarked about hearing shots, but she didn’t recall any mention of Kaser being shot at that time. First knowledge of the slaying was later that night when her brother, who had baby sat for them, returned after taking his girl friend home. Her husband had made no mention of this during his testimony. Oveross’ activities for part of the evening of the crime were traced in testimony of several state’s witnesses. Richard (Shorty) Kiefer, owner of Shorty’s Tavern near Silverton, stated Oveross was in his tavern at 3 p.m., again between 6 and 7 p.m. and from about 7 to about 10 p.m.
Rodney Oster testified he talked to Oveross during the evening at Shorty’s. He said Oveross told hiim some of his troubles, stating his wife was supposed to be out to lodge but he knew she was not. “They’re out together,” he was quoted as saying. he also remarked about a friend who was serving 99 years for murder and that it wasn’t worth doing anything about. Oster and his wife both told of going to the Town House, a combination bar and restaurant in Silverton, where they were from about 10:30 to 12:30 o’clock that night. Both stated they did not see Oveross there during that time. They said they heard of the shooting while there, but couldn’t recall the time. Mrs. Rose Mary Teglund of Silverton testified she saw Oveross at Frank’s Grocery in Silverton about 8:15 p.m. that night. She recalled the time because they had rushed downtown between TV programs which they wanted to see. Denny Legard, who operates Legard’s Union Service station in Silverton, testified Oveross bought $2 worth of gasoline at his station about 8:30 p.m. that night. On cross examination he reported he didn’t recall Oveross’ car making any undue noise as it arrived or left the station. He said he thought Oveross drove toward town when he left. George L. Hopkins and his wife, Shirley, who occupied the cabin adjacent to Oveross at the Holland Apartments, and Mrs. Hopkins’ brother, Duane L. Mattox who was at their home during part of the evening, testified about comings and goings at the Oveross place. All stated a car came to the cabin about 8:30 p.m. and another time a car came shortly after 11 p.m. Hopkins insisted that lights were not on at the Oveross cabin when he arrived home at 10:30 p.m. He said newspapers had been over the windows of the Oveross cabin since he had moved in. Wayne Moore, next-door neighbor to Oveross for several years, told of going hunting with Oveross in 1951-52-53. He said Oveross owned a 30-30 carbine but he didn’t know what kind of a gun it was. When shown state’s exhibit No. 21, the gun fished from the Pudding River, he said it looked lie the gun but, “I couldn’t swear it was the gun.” Moore said the last time he saw the gun was in the spring or summer of 1954 when he saw it standing in the corner of the kitchen at the Oveross home. He testified also Oveross had talked to him in the spring of 1953 about Ervin Kaser, stating that his wife was stepping out with Ervin Kaser. Just before the divorce Moore said Oveross told him if “I didn’t quit associating with Ervin Kaser we weren’t going to be very good friends.” He also said an Oldsmobile is mixed up in it and he hoped it wasn’t mine. “I would consider him a good shot,” said Moore when asked by District Attorney Brown on that matter. Moore said he had never heard Oveross deny owning a 30-30 rifle and had no knowledge that he had ever denied it to anyone else. At the close of the trial day, Silverton policemen James Painter and Merle Bethscheider were called back to the stand to testify concerning their entry of Oveross’ cabin during the night of the slaying. Both stated they entered the cabin because they considered the possibility there may have been a suicide. They said the lights were on, newspapers over the window, key in the outside of the door and they knew the cabins were equipped with gas. They stated that a box containing .30 caliber shells, shotgun shells and other items which were later found in the cupboard were on the draining board when they entered the cabin the first time. Both admitted they did not have a search warrant at the time and Oveross was not there, but said they felt that knowing Oveross was a suspect in the crime that there was a possibility of suicide. Chambers of Circuit Judge George R. Duncan became an unprecedented rifle testing area Thursday as the state sought to bypass defense objections to evidence in the first degree murder trial of Casper A. Oveross. Materials for the test were rushed to the Marion County Courthouse from the State Crime Detection Laboratory in Portland in order to permit use of the 30-30 Winchester carbine which the state claims is the gun with which Ervin Kaser was slain last Feb. 17. The test, conducted by Ralph Prouty of the crime laboratory, climaxed the 13th day of the trial in which one state’s witness asserted two others had lied, and another couple testified Oveross paid a nighttime visit to their home on the night of the slaying. James Gilham and his wife Jennie Gilham, who reside about seven miles south of Silverton, testified Oveross was at their home to see Gilham’s son Daniel the night Kaser was shot to death at his home. Mrs. Gilham fixed the time as 11:15 p.m. by her clock “which always gains a little.” Gilham said the clock was 15 minutes fast when he retired at 9:30 p.m.
“That’s a lie, yes!” Gerald (Jerry) Hoyt, Silverton bartender, said on the stand Thursday when Bruce Williams, defense counsel for Oveross, asked what would you say if I told you two Silverton policement quoted you as saying Oveross was a good suspect in the murder. It was a day of some frustration for prosecutors Charles Raymond of Portland, and Marion County District Attorney Kenneth O. Brown. They were blocked on attempts to have admitted as evidence what was described as two key exhibits in the case. One of these blocks they hoped to get around with the test firing Friday night. Attempts to have the Ames Hardware Company invoice, showing shipment of two 30-30 Winchester rifles to the store in 1949, admitted as evidence for the state were blocked by sustained objections of the defense. The invoice contains serial nubmers of the two guns, one of which was sold to Steven Zolotoff of Silverton. The state contends the second rifle was sold to Casper Oveross and is the rifle with which Kaser was slain. The serial number of the murder weapon is the same as the one of those appearing on the invoice. An attempt to enter a test-fired cartridge from the murder gun which the prosecution said would compare with one taken from a target range in back of the Oveross home was also blocked by the defense on the grounds the test was not made by legal standards. Court resumes at 9:15 a.m. today in what may be the windup of the state’s direct presentation of evidence. Only a handful of witnesses remained to be called. One of these, however, is Daniel Gilham who his parents testified talked with Oveross outside their home on the murder night. Prouty told of comparing the round from the gun and two of those found in the Oveross cabin and said it was his conclusion they were the same type and make (Remington UMC). A third round was not the same, Prouty testified. An empty cartridge which Sheriff Denver Young had testified to removing from Oveross’ jacket pocket on the night of the slaying was withdrawn from consideration after Prouty testified his examination indicated it was fired from another gun. He said comparisons shoed the cartridge had been fired from a .30 caliber Savage owned by Virgil Huddleston of Silverton and which Oveross said he had test fired on Feb. 17, date of the slaying. A cartridge from a round test fired through the murder weapon was brought in by Prouty who said it compared with another shell which Jeffery Kaser, young son of Harvey Kaser, told of picking up at the Oveross home some two or three years ago. He said it was his conclusion they had both been fired in the chamber of the death gun. Also offered were photographs aimed at showing points of comparison of the two shells. All of these exhibits were offered as evidence but were rejected when Skopil stated that one of the rounds was of Winchester make and the other of Remington. He quoted Oregon law to show that tests must be made with material as nearly identical as possible after drawing the admission from Prouty that he had Winchester cartridges with which he could have conducted the test. Prouty stated the reason he had not used identical brands was that it did not make any difference for this particular test. The defense action brought a request from Special Prosecutor Charles Raymond that the state be permitted to use the evidence rifle to make tests with the similar cartridges. The permission was granted by Judge George R. Duncan over the objections of Skopil. The test was conducted in the presence of the defendant after court recessed Thursday night. 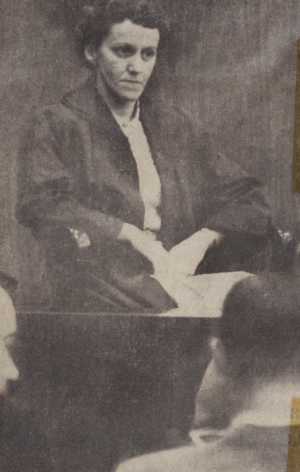 A special box used at the crime laboratory for catching bullets without damage was brought to Salem from Portland and the test was made in the office of Judge Duncan’s secretary, Mrs. Rose Howard. It was expected the prosecution would make an attempt to have the new cartridges admitted as evidence for the jury sometime today. Technique of photographing bullets for comparison purposes got some close examination from Counsel Skopil, too. He questioned Prouty for some 20 minutes at one time on the lighting used for microphotography. Prouty testified that every effort was made to have light strike both the evidence and test bullets in the same way, but that often the differences in coloration on the bullets did not indicate this. This was his explanation for the fact that what he had described as peak characteristics did not always appear to be the same color in the comparisons. Skopil asked Prouty why he didn’t use some cleaning solution such as a salt solution for cleaning foreign matter from the bullets. Prouty answered that he had not wanted to destroy any of the original characteristics of the bullet and thus be open to criticism on that count. Prouty was one of 13 witnesses appearing for the state which appeared likely to wind up its case today. Bulk of the day’s witnesses testified to activities of Oveross on Feb. 17 or to knowledge of a gun. One of these, Gerald Hoyt, a bartender at the Town House in Silverton, denied testimony of two Silverton police officers that he had named Oveross as a suspect after hearing of the shooting. Hoyt also testified he had not seen Oveross during the evening of the crime, but that he came in about 12:45 a.m. the next morning and had a 7-Up highball. Hoyt’s wife testified Oveross had had a cup of coffee in the cafe portion of the Town House before leaving between 1 and 1:30 a.m. Preceding the Hoyts on the stand were Ray Ruscher of Mt. Angel, M. G. Eisenhart, Silverton gunsmith, Charles Hopkins, formerly of Silverton but now of Salem, Sgt. Wayne Huffman of State Police and Joseph Walker, a Mt. Angel area farmer. Ruscher told of seeing Oveross at Shorty’s Tavern at Silverton until Oveross left about 10 p.m. Eisenhart recalled that Oveross had a 30-30 rifle, but he didn’t know what kind. Hopkins told of a sidewalk conversation with the defendant in the fall of 1954. He said Oveross had been drinking and was feeling badly about his family situation and remarked he though he should have killed both of them. Oveross also mentioned a friend who was doing 99 years for murder, and also about lying out all night watching while Kaser visited his former home, Hopkins said. Sgt. Huffman told of contacting Ethel Oveross, ex-wife of the defendant who was with Kaser until a few minutes before he was slain. He mentioned of contacting a Joseph Walker, a farmer near Mt. Angel during the investigation. Walker took the stand to report a conversation with Oveross near his farm about two miles south of Mt. Angel in which Oveross had stated he was looking for tire tracks in October of 1954. He mentioned something about his divorce and alimony, Walker testified. Walker said he observed a part of a case of beer and a gun in the car, but couldn’t say whether it was a rifle or a shotgun. Some details of the night Oveross was first arrested in connection with the crime were reported in testimony of Lt. Farley Mogan of the Salem district office of State Police. he said he had asked Oveross if he wanted to make a statement when he first saw him at 8:50 p.m. on the night of Feb. 22, adding he declined to answer at all to this question or any others about age, physical description, etc. Mogan said Oveross was at the state police office for about 45 minutes and that he had personally made attempts during that time to contact his attorney Bruce Williams. During cross-examination he explained the presence of newspaper reporters by saying they had apparently sensed something was up and had been around the office for several hours. Two other policemen followed Mogan to the stand. Frank Dederick now with the State Police at Eugene told of target practice at his uncle H. A. Barnes’ place south of Silverton which was joined by Oveross last September. Shown the 30-30 carbine, he stated “It looks like it; It was a gun similar to this…” Oveross used. Lewis G. Johnson, assistant director of the state bureau of identification, testified he was not successful in securing any fingerprints of value at the crime scene the night of the shooting. Marian Zahler, onetime bookkeeper for the Ames Hardware Co., returned to the stand during the afternoon as the prosecution attempted once again to have an invoice admitted as evidence. She testified that a jobbers’ invoice file shown was the file for the company for Jan. 1 to June 1949 and indicated that no other .30-.30 Winchester rifles than the two in question were received by the store during that time. Defense blocked the new effort charging there was no proof that Mrs. Zahler was the custodian of the records, and that the invoice in question was a copy. The nighttime visit to her home by Oveross was related by Mrs. Jennie Gilham who testified he had been there for a few minutes Feb. 17, 1955 shortly after 11 p.m. She said she could see him arrange something in the back seat with a folding motion while he waited for her step-son Daniel Gilham to come outside. Part of her testimony was corroborated by her husband James Gilham, who said he recognized Oveross’ void when he called to Daniel. Daniel Gilham, 19-year-old boyfriend of Casper Oveross’ daughter, testified Friday under oath that Oveross had come to his home during the night Ervin Kaser was slain and asked him to be his alibi. “Ervin has three slugs in him and I was with you last night,” Oveross was quoted as saying by young Gilham. Oveross, 43-year-old Silverton carpenter, is on trial in Marion County Circuit Court here for the rifle slaying of Kaser at the Kaser home south of Silverton last Feb. 17. Gilham, apparently torn between two allegiances, was on the witness stand for nearly an hour as the state moved toward the close of its case which has now taken 11 days to present. Prosecution plans to rest its case Friday were detoured because its final scheduled witness, Ralph Prouty of the State Crime Detection Laboratory, was involved in an automobile mishap while en route to Salem from Portland to testify. Gilham, a husky looking blond who had been one of Oveross’ hunting companions last fall, related details of the night of the slaying, and of threats of arrest if he “didn’t cooperate” with police. Marion County Sheriff Denver Young threatened to “put me in the Marion County jail and hold me under $50,000 bail as a material witness” if he didn’t cooperate, Gilham asserted. Gilham said Young also accused him of driving the car for Oveross on the night in question and of getting rid of the murder weapon. He said he was later submitted to a lie detector test at Eugene but did not know the results. Special Prosecutor Charles Raymond, who questioned Gilham about the events of the night, interrupted him once to say he was surprised at his testimony. Gilham was then shown a signed statement by Raymond to “refresh your memory.” This was apparently directed at Gilham’s testimony that he could not identify the driver and car which had honked at him as he backed from the Oveross driveway after spending the evening of Feb. 17 with Colleen, Oveross’ attractive young daughter. Gilham stated that the statement was written by Sheriff Young, but that he had signed it on Feb. 22 the same day Oveross was first arrested in connection with the murder of Kaser. Final state’s presentation, which Prosecutor Raymond promised the court would take only ten minutes, was postponed until Monday because of the inability of Prouty to take the stand. Dr. Homer Harris, director of the crime laboratory who examined Prouty at Salem, said he was apparently suffering from exhaustion. he was taken to Portland where he was scheduled to be hospitalized for observation Friday afternoon. The state will rest its first degree murder case against Casper Oveross Monday morning, prosecutors said Friday after an automobile accident forced postponement of testimony by the final state’s witness. 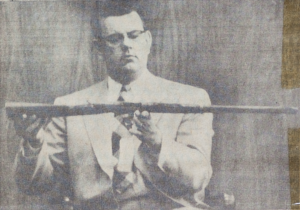 Ralph Prouty, state ballistics expert who was scheduled to testify to the results of new cartridge tests Friday in the windup of the Ervin Kaser murder case, was hospitalized in Portland for observation following the mishap. Dr. Homer Harris, director of the State Crime Detection Laboratory, took the stand briefly Friday afternoon to tell the court that he had examined Prouty and considered it unwise for the young technician to testify at this time. Prouty was the object of a valley-wide search by police Friday morning when he failed to appear at the Marion County Courthouse here to testify as scheduled. His wife had reported he had left his home in Portland to drive to Salem about 7:45 a.m. According to state police, Prouty was found at 11:54 a.m. either unconscious or asleep in his car where it had run into a ditch near the Wilsonville Bridge about midway between Salem and Portland. He had apparently gone to sleep and driven off the road, police said. Patrolman Malcolm Clarkson, who found Prouty, said he had considerable difficulty arousing him. Dr. Harris explained that Prouty had been keeping a heavy schedule of work and had not had sufficient sleep for several days. He had spent much of the night completing comparisons on cartridges fired through a 30-30 carbine which the state claims is the murder weapon. The gun was test fired Thursday night in the chambers of Circuit Judge George R. Duncan after Defense Counsel Bruce Williams and Otto R. Skopil Jr. had objected to the legality of earlier exhibits presented by the state. Special Prosecutor Charles Raymond said Friday he had talked by telephone with Prouty at the crime laboratory at midnight relative to results of the test and that he had been told the test was successful but that comparison pictures had not been taken yet. Prouty, who has testified three times during the course of the 14-day trial, had been under close cross-examination by the defense regarding his expert testimony. Though shortened by the mishap, Friday’s court action marked important developments and testimony for both the state and the defendant. The development evolved from the testimony of Daniel Gilham who said the defendant had asked him to be his alibi after stating “Ervin has three slugs in him…” Gilham said he had left his Victor Point home about 6:30 p.m. the night of Feb. 17 and had gone to Colleen Oveross’s home. He told of the arrival of Oveross there about 8 p.m. and his departure about half an hour later. Gilham stated he stayed at the Oveross home until about 10:30 when he left for home. As he was leaving he said a car went up the hill (toward Silverton) and honked twice at him. He said the car “resembled Cap’s.” Gilham said he went to bed right after getting home and was awakened by his step-mother, Mrs. Jennie Gilham, who said someone wanted to see him. “Who was that someone?” Prosecutor Raymon asked. Q. What did you wear outside? Q. Now, Daniel, what did Cap say to you? A. He said, Ervin has three slugs in him and I was with you last night. He didn’t say what time or anything like that. “I am surprised,” Raymond exclaimed. At this point he had a signed statement handed to Gilham on the witness stand. Q. Did you make that statement on the date mentioned which was on Feb. 22, 1955? “Wait a minute!” said Raymond. Later after Gilham had viewed the statement, again Raymond continued the questioning. Q. Now Mr. Gilham hvaing refreshed your memory — Have you refreshed it? Q. Is there anything you wish to add about what Mr. Oveross said to you at that time? A. Well, he said I was his witness that he was with me that night. During cross examination Gilham was allowed to extend his statement about a threat of arrest by Sheriff Young despite repeated objections by District Attorney Kenneth O. Borwn and Raymond. Williams asked “Is it not true that Sheriff Young stated that unless you cooperated you would be placed in jail as a material witness under $50,000 bond?” “That is right,” Gilham answered quickly. Gilham told of being followed from Silverton by Deputy Sheriff Amos Shaw and State Patrolman Lloyd Riegel when Colleen was with him and stopped about half way to the Oveross home. They said he had to go with them for questioning, Gilham said. “Did they have a warrant for your arrest?” Williams asked. “They said I should go with them to make a statement,” Gilham said, adding thta he wanted to drive over in his car but they said he should go over with them. “They were standing in what I call the living room there and I said…” At this point Gilham’s testimony was interrupted by Judge Duncan who asked what the defense intended to show with the line of questioning. “To show that Mr. Gilham was taken without benefit of warrant,” Williams asserted. Prosecutor Raymond’s objection which had prompted the judge’s action was sustained and testimony was concluded on that question. Attorney Williams was reprimanded by the judge a few moments later after a series of questions in which he asked about the sheriff’s reported threat, the accusation about driving for Oveross and the lie detector test. Gilham answered all three before prosecution objections could be interjected. GIlham testified that Oveross had appeared calm during the two times he saw him that night. He said after talking to Oveross he had gone back to bed and went back to sleep after awhile. Only other witness to testify Friday was Deputy Amos Shaw who pointed out to the jury the relationship of the Gilham home, the place where the rifle was found, Kaser’s residence, Shorty’s Tavern, the Joseph Walker farm, and the Holland Cabins where Oveross lived. Shaw stated he measured the distance from the murder scene to Gilham’s as 5.3 miles and the same distance from Gilham’s to the Pudding River bridge. He estimated it was about eight miles from the bridge to Silverton and about two miles from Shorty’s Tavern to Silverton.